1 Arm Sleeve: $17.956-11 Sleeves: $16.95 ea.12 and up: $15.95 ea. 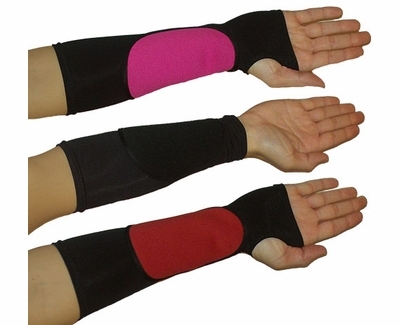 These colorful VBALLSLEEVES from Arm2Aim are a great dual-purpose, protective volleyball training sleeves, offering protection against the sting of the volleyball while enforcing proper bump pass technique. 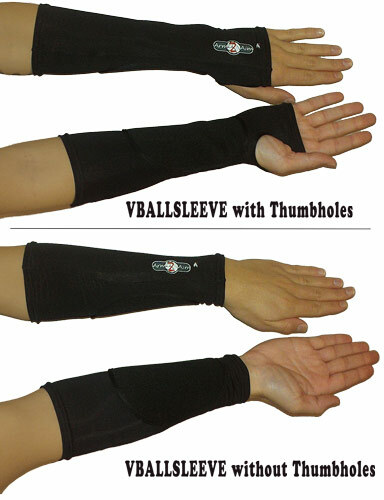 The Vballsleeve is available in two great styles as well, one with thumb holes and one without thumb holes. Younger volleyball athletes have found the thumb hole to be beneficial in helping to keep the pad placement correct. Vballsleeve Volleyball Training Arm Sleeve Sold (2) per Package (one pair). � Colored Target area reinforces turning elbows inward and setting the platform for optimal bump pass technique. � Approved for use in official game play, Great for indoor and beach volleyball. � One size fits most. Ages 9-16+ years. � Lycra (a mix of spandex and nylon) / SBR pad, Sleeve Length � 10.25 inches / 26 cm. � Black with Pink Target, � Black with Black Target, � Black with Red Target. 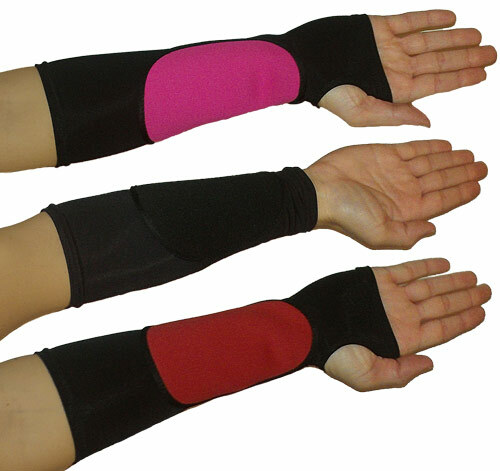 Protective volleyball training sleeves encourage players to discover their love for the game and develop their skills without hesitation or fear of the sting of the volleyball. Today, kids are still complaining to their coaches or teachers about reddened or pink arms asking to sit out of from bumping the volleyball, there is science to support their complaints. Children have less muscle mass in their forearms making the nerve endings that run along the Radius bone more sensitive. As players mature, the sting is more prevalent in women as they do not develop as much muscle mass in their forearms as men. � Set the Platform - The platform is the area between your wrists and your elbows where you make contact with the ball. This is also the colored "Target Area" on the VBALLSLEEVE. � Place your thumbs down on top of your grasped hands, pointing forward. Make sure your thumbs are lined up right next to each other and at exactly the same height. Do not cross your thumbs. � Tilt your wrists down toward the floor. � With your arms locked straight and your hands at waist height, angle your elbows slightly inward as much as you can without changing your hand position. This will expose the flat side of your inner forearm and create your platform. My Granddaughter is small for her age and the smallest sleeve was too small. Took it to our alteration shop and had them taken in. They fit like a champ!